This image shows the bridal party at a wedding that was held at Atlantis Toronto. I took this shot on the rooftop of Atlantis Pavilions during the creative photos session right after the wedding ceremony. The composition in this photo is unique with the bridal party in the lower left corner while the rest of the frame has negative space to increase drama. The dominance of the negative space and report to the positive space gives this wedding picture tension and makes it unique. The bride is pointing to something in the upper right corner of the frame. Everybody is looking at the bride and she is pointing towards a mysterious object we can not see. The fact that we don't know what the object of her attention is, increases the mystery of this shot. From a pure photographic composition standpoint, the multiple leading lines make the viewer of this image go over a multitude of points in the frame. The bridal party members look at the bride, while she is pointing towards the sky. For this image I used a 70-200 lens and moved out to the end of the building on a ramp from where I could see this frame. I called my assistant on his cell phone and asked him to direct the wedding party according to my instructions. The exposure was very difficult as it was overcast that day and the camera was fooled by the back light. 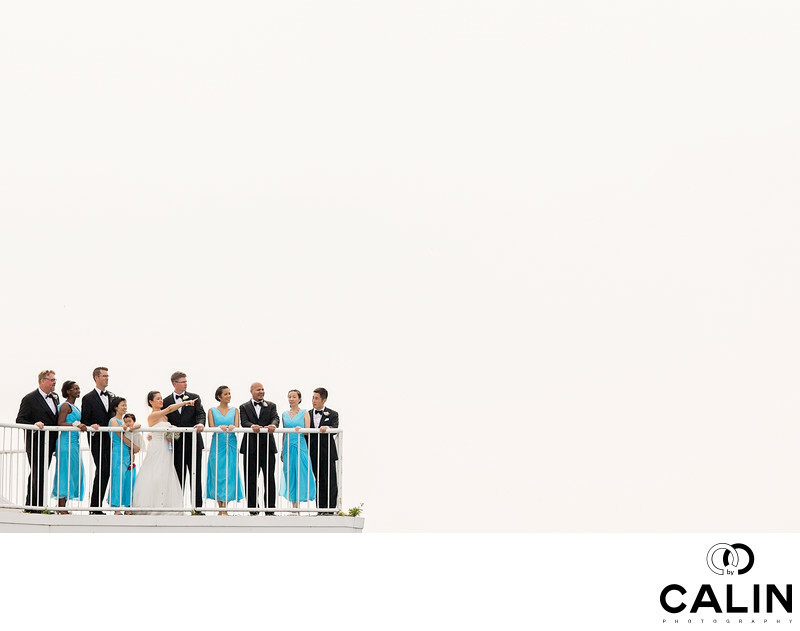 After a few test shots, I was able to overexpose the sky so it feels like the whole bridal party is floating in the air. This image was so masterfully captured in camera, that I didn't need to do much in post processing. Besides adjusting the white balance and the exposure, I did not process this image further.